Luis Suarez had some Fantasy Football fans nervously checking if they remembered to put him in their team during the week. CERTAIN PEOPLE, WHO shall remain nameless, chose to ridicule this canine for the decision to put Luis Suarez in my fantasy team a few weeks back. The Uruguayan practically beat Norwich on his own during the week and probably would have done so if he tried. 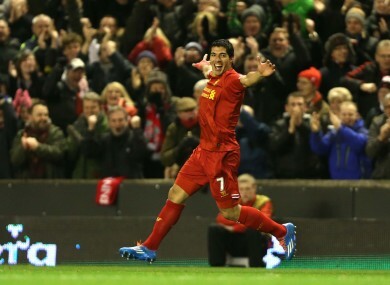 TheScore Machine team can’t say we shed any tears for those foolish or lazy enough to leave Suarez out of their side. As a dog wiser than myself once said, ‘leave Suarez out after he’s scored a hatful of goals, shame on you, leave him out again the next week… no seriously, shame on you’. Elsewhere, another Liverpool legend, Jonjo Shelvey, comes into our team, as Ravel Morrison is suspended (not to mention rubbish). In addition, Oscar’s injury has forced us to give him the boot, but don’t worry — we have another expensive and ridiculously talented foreign import in waiting in the form of Mesut Ozil. Given that Arsenal unquestionably have the best midfield in the Premier League, we’ve decided to adopt the ingenious strategy of slowly flooding that area of the team with Gunners players. Now that’s tactics for you — Jose Mourinho eat your heart out. Wha? Moreover, all that brilliance and all those free transfers to use, and yet somehow, Peter Whittingham remains in the side. Though it may sound like as ludicrous a concept as letting Sandro drive a bus full of millionaires to Fulham, let’s just say we like having him around to stop the talented players from getting complacent. As any half-decent team who’s played Norwich this season has shown, great players aren’t inspired by the big occasion — in fact, they are inspired by the tantalising prospect of playing teams who can barely string two passes together and don’t defend properly. So having young Peter in the team will surely inspire them to achieve previously unreached heights. Whittingham is also the type of player ‘Arry Redknapp loves — a real leader of men in the Shaun Derry/Clint Hill mould who give the team some real steel to counteract those prissy foreign primadonnas. He also happens to be rubbish, but that’s irrelevant — he’s the equivalent of 10 Luis Suarezs for what he brings to the dressing room. Anyhow, I’m off to imagine all the tins of Pedigree Chum I’ll be able to buy from backing myself to win TheScore.ie‘s Fantasy League. Until next time, bark bark! Email “Diary of a Fantasy Gaffer: Those without Suarez as captain need not apply ”. Feedback on “Diary of a Fantasy Gaffer: Those without Suarez as captain need not apply ”.